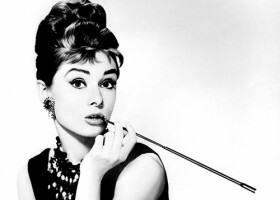 Hepburn was a cosmopolitan from birth. Her mother was a Dutch baroness, and her father, born in the Austro-Hungarian Empire, and of English and Austrian descent, worked in business. In the movies she appeared as a delicate adolescent, a look which remained until her last movie Always (1989) directed by Steven Spielberg. Her career as actress began in the English cinema and after having been selected for the Broadway play “Gigi” she debuted in Hollywood in 1953. With Roman Holiday (1953) she won an Oscar; her favorite genres were the comedies like Sabrina (1954) or Love in the Afternoon (1957). At the end of the sixties she retired from Hollywood but appeared from time on the set for a few films. From 1988 on she worked also for UNICEF.